This Beachwalk townhouse is most likely the CLOSEST 3 BR CONDO TO THE BEACH in all of Shipyard Plantation. It will let you return to the idyllic summers of yesteryear, but with all of the modern amenities of today (3.5-baths)! The front door opens to a brand new tiled foyer and hallway. To the right, the sunken living room features two plush sofas, an entertainment center with a 42' HD TV/DVD and a great view of the lagoon and golf course. The room also has large glass sliding doors that open to a separate and private 2 tiered furnished deck with a scenic lagoon and golf course view. Further down the hallway is a convenient powder room that, in turn, gives access to a small laundry room with a full-size washer and dryer. The hallway ends at a great room with sofa, club chair, large flat screen HD TV, and a slider door to a second deck, which has outdoor seating and a charming lagoon & golf course view. This condo has 2 extremely rare and desirable features that few others can match. This condo has 2 separate rooms where the adults can be watching what they want on TV while the children are playing video games or watching their own TV shows in an alternate room. Each of the rooms open to separate secluded two-tiered decks that are on the lagoon and overlook the golf course as well. A center island, with a built-in stove, acts as a room divider where there is a brand new spacious and fully equipped kitchen area featuring granite counter-tops, as well as a sunny dining area with a table and greenhouse-type windows and skylights which make for cheerful breakfast and romantic dining experiences. At the top of the second floor stairway is the sunny and bright master bedroom with a king-size bed, TV, a large window, a slider door with a viewing rail that overlooks the lagoon and golf course, a walk-in closet, and a NEWLY RENOVATED bathroom that includes a Spa-like and luxurious walk-in shower. Down the hall and around a corner are a hall bath, a bedroom with two twin beds, TV and the third bedroom with a Queen bed and a full private bath. This BR also has a window with a lagoon and golf view. A new gas grill has also been added for your enjoyment as well as new furniture in the den. Shipyard Plantation is centrally located on beautiful Hilton Head Island and provides easy access to over 200 restaurants, unique shopping, and world-class golf. The plantation borders 12 miles of white sandy beach and offers bike paths, golf courses, tennis courts, and an abundance of natural beauty. The Beachwalk section of the plantation has an on-site pool and is located just a very short walk from the beach. In addition, the golf and racquet clubs are close by. Renters also enjoy discounted day or weekly bike rentals. Please let the owner know if you would like to see more pictures or have any questions about the unit. Also, please note that I can only rent from Saturday to Saturday between Memorial Day week and Labor Day week. 3.5+ with a renovated master bath including a walk-in shower with a rainfall shower head. (5) INCLUDES A 40' 1080D LCD TV IN ONE OF THE LIVING ROOMS PLUS TVs IN THE OTHER LIVING ROOM AND EACH OF THE 3 BEDROOMS. available nearby for as low as $15/hr. DIRECTLY ON A LAGOON WITH THE GOLF COURSE ON THE OTHER SIDE, 2 SEPARATE PRIVATE TWO TIERED DECKS, NEWLY RENOVATED TILE FLOORS, NEW PAINT AND CARPETING, NEW FURNITURE AND WINDOW TREATMENTS, NEWLY RENOVATED KITCHEN WITH CUSTOM CABINETS & GRANITE COUNTERTOPS AND NEW APPLIANCES, LESS THAN 300 YARDS TO PRIVATE BEACH AND BEACH CLUB, THIS IS MOST LIKELY THE CLOSEST 3 BR CONDO TO THE BEACH IN ALL OF SHIPYARD. 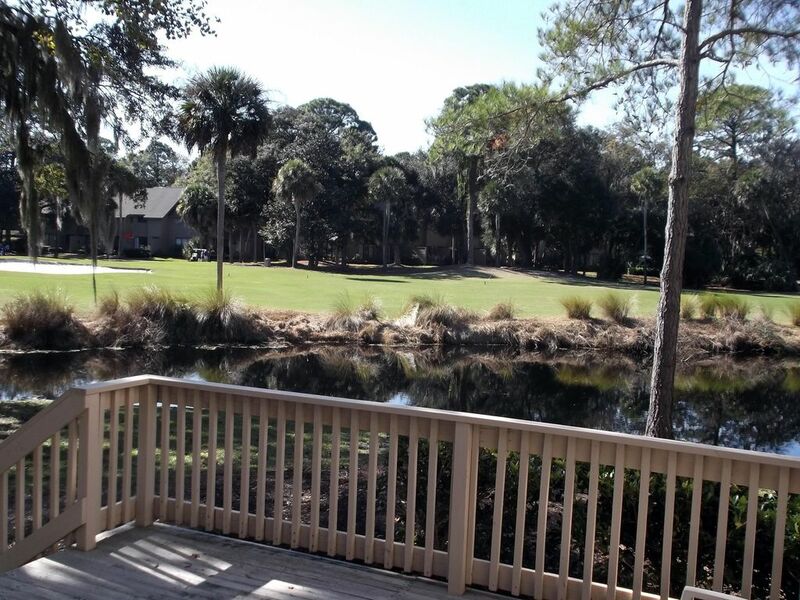 The condo was bright and airy with great views of the golf course and lagoon. In addition, it was a short walk to the beach. We had a great time and look forward to returning. It was a beautiful property. We enjoyed it very much. The owner made himself available when I called with any questions and addressed any concerns or issues I had in a very timely manner. He was very kind and a pleasure to work with. I would definitely recommend as well as stay at his property again. First off, this home offers lots of room for everyone to spread out. The decks, both off of the 1st floor, offer a lot of seating or places to suntan. The half bath downstairs adds convenience for those not wanting to go up and down the stairs. The pool is located across the street from this home's parking lot. The walk to the beach is not too bad and we did see a shuttle picking up/dropping off people at the clubhouse but never used it. If you plan to be outside in the evenings, I highly recommend bug spray of some sort. We did have an alligator one evening in the lagoon right behind us so beware if kids are outside. The grill was not new as stated in the property details. Inside pieces were rusted and crumbling so we had to clean that out prior to using. I took a few pictures as proof. The kitchen could use more dinner size forks. There are a lot of forks but most are small/short ones so not typically what you need for a meal. The home has no extra towels or washcloths so be prepared to do laundry often. It would be nice if the owner would at least offer extra washcloths. Most people do not want to reuse those. I understand things may have been stolen or damaged and not replaced so these are just things I recommend to be fixed. The master bedroom has a ceiling fan that is locked on low (which you can't even feel blowing or change the speed of) and that room stays much warmer than the rest of the upstairs. Not sure how to correct this unless maybe a stand fan could be offered for guests to use. This is a good bedroom if someone in your group stays cold or prefers a warmer room. We never had an issue with hotwater and there were 7 of us. We were there during a holiday week and parking was bad. No where enough room for the amount of units located there. Also, the parking lot has no assigned spaces and the parking lot is not striped. I know the owner cannot control any of that so I'm just providing the information for anyone traveling during a busy time or with multiple vehicles. This home is located in a section where several other home entrances are so you cannot always park near the home. It's probably better in the off season. The downstairs a/c is locked and will not go below 72. This was fine for us. I would definitely see if this home was available if we visit again. The few things I mentioned are just small items, nothing major wrong and we did not have to contact the owner any. Overall, great place! Thank you for the detailed comments about our condo. We are very glad that you enjoyed your stay and are interested in coming back again. As for the minor issues you experienced, I am disappointed that you did not contact me to provide resolution. However, providing the feedback you did is extremely helpful to us as we have not heard about ANY of them before. - As for the grill, it was in good working condition when the summer season began, but we will replace it over the winter. - We will perform an inventory of all the utensils and stock up on whatever is needed. - As for extra towels, it is very difficult to provide enough towels for 7 people to use at the beach, pool and for showering for 7 days so it may be necessary to wash some during the week in our washer/dryer machines. However, we will speak to the cleaning service and see if they could provide more towels and washcloths. - The fan in the master bedroom stays on 24/7 in order to ensure that there is constant air flow movement. We will provide a portable fan as well if more circulation is needed by the guest. - We are sorry about the crowded parking lot but the July 4th week is the busiest week of the year on the Island. Once again, thank you for the comments that give us the opportunity to improve as we want all our guests to have the best experience possible. We also stay there and strive to keep the condo in excellent condition as if it was our full time home. Very clean. Excellent location close to the beach. The condo was spacious and well appointed. However, the amenities, especially in the kitchen, could be better. As foodies we were disappointing in the quality of utensils, pans, etc that we had to prepare food. The condo is also further away from the beach then implied by the write up. Thanks for the comments. I will have the utensils and kitchen ware updated by the summer. Beginning with the location to the quality of the house, we could not have asked for better! The layout of the home is perfect for multi-family vacation. If one group wanted to talk/play games and another wanted to watch Game of Thrones, this condo was fantastic. Each if the three BR had their own bath, very positive. New bath uplift in master was gorgeous and the waterfall shower was a blast for the grandkids after rinsing off outside after fun day at the beach. I promise the next time we visit HHI will be staying at this location (if available, after this review I might be limiting our chances). Can't say enough positives about our experience. The multi-decks were also great for "happy hour" & family cookout. Wildlife views were great for grandchildren and those young at heart. View of 5th hole Par 5 was fun watching golfers suffer as members of our party had done earlier. Condo not more than 30yards from green.